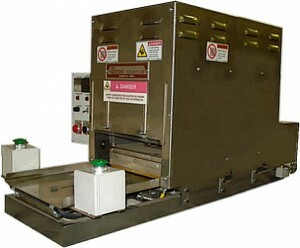 The Model Z-812-P is a automatic shuttle type seat clamshell heat sealer designed to seal clamshell blisters for low to medium volume production requirements. Locating pins on the heat seal press shuttle table allow for the use of quick change seal tools, which may be manufactured from wood, plastic or aluminum; depending upon application requirements. These systems are typically used for clamshell packs, but can also be used for traditional blister pack applications utilizing Tyvek, foil, thin plastic, laminated film stock, etc..